As of 09/01/2011 lenders and appraisers doing work FannieMe underwriting guidelines are required to use the new UAD appraisal forms. The intent of this new guideline is for FannieMae and GSE to capture consistent data, and to manage risk. This involves the major forms; the condo and URAR Single family reports. Four forms are new, and they are: the 1004, and 2055 Single Family; and, 1073 and 1075 Condo forms. The 1040 MC Market Conditions form has not yet changed. Yesterday it was announced that FHA will also use the new UAD forms! It affects both the lender and appraiser and each have special requirements in dealing with UAD. We must sent the lender PDF in an "XML" format, and the data is taken out of the appraisal report for analysis. We have taken training on the new guidelines, and have successfully sent a report using the XML delivery and we are ready to deliver the UAD, XML report consistent with the GSE/UMDP guidelines now or by the 09/01/2011 deadline. You will also receive a PDF copy of the appraisal report as you are accustomed to seeing it. Changes to the appraisal forms include standardized abbreviations. There are ratings for the quality of construction, condition, and location. For instance, the bed / bath disclosure will be standardized with a decimal. Such as a home containing two and one-half baths will be shown as "2.1" with the decimal separating them. A bathroom count of two full baths, with two half baths will be indicated as "2.2." Other changes are to the "condition" and "quality" ratings. They will be labeled C-1 thru C-6, and Q-1 to Q-6, with C1 and Q1 being the highest and C6 and Q6 being the lowest, respectively. http://www.alamode.com/labs/projects/UMDP/default.aspx This is an excellent Alamode summary of UAD requirements. https://www.efanniemae.com/sf/lqi/umdp/uad/index.jsp Fannie Mae epage with great information on UAD. It has definitions to the condition and quality ratings. Delivery of the report by the appraiser should be done with a “first generation PDF, and embedded (encrypted) XML file”. Below is an analysis of short sales and REO sales (only) as a percentage of total sales in selected markets. Data is as of 12/02/2010 looking back 12 months and for sales only (no listings, expired, withdrawn or pending sales). 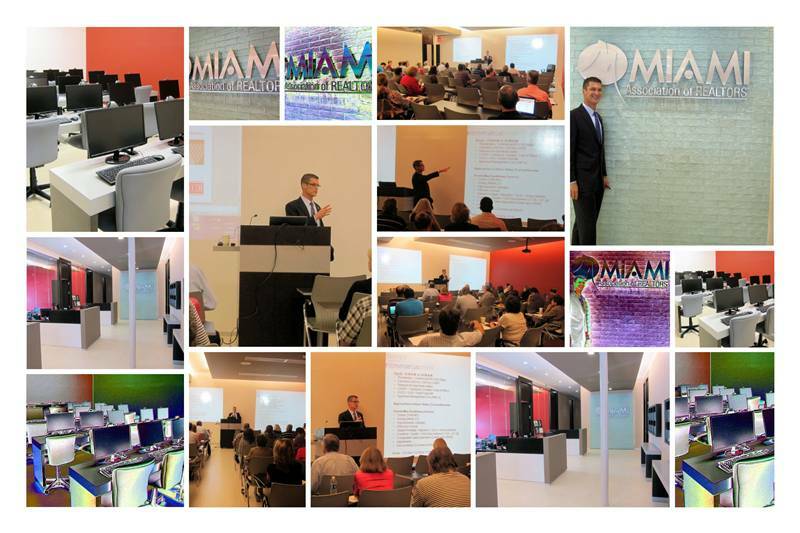 The Realtor Association of Greater Miami and the Beaches (RAMB) and the Association of Miami-Dade County (RAMDC) have joined forces and are now the nation's largest Realtor association. This historic merger brings together two of NAR's largest associations, creating a combined association. The association is more than 23,000 members strong. The new association will be named Miami Association of Realtors and it will be approved on August 31st. My Dad, Kenneth D. Rosen, CCIM, is a two time past President of the "Miami Board," which merged with the old "Gables Board." I also served as Chairman of the Miami Board Orientation Committee in 1986. Realtor orientation is required of all new members. The old board building was in N.W. 7th Street immediately N.W. of the old Orange Bowl site, which is now the sales office for the Florida Marlins. Last month I attended a talk on market trends by Realtor Ron Shuffield, President of EWM. 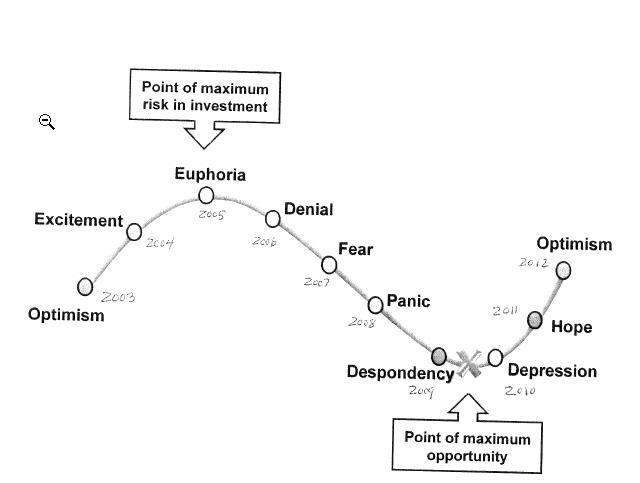 Ron thinks we are at the point of "maximum opportunity" regarding real estate investment as we are approaching the bottom of the cycle. 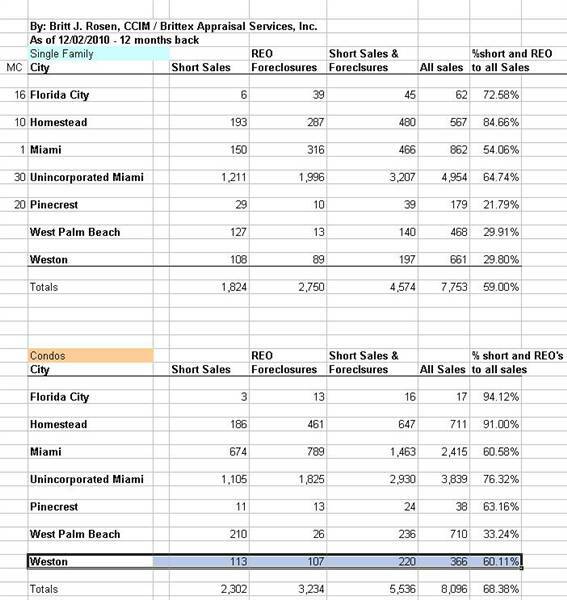 The 2nd chart (below) shows we are quickly absorbing the available stock of homes in <?xml:namespace prefix = st1 ns = "urn:schemas-microsoft-com:office:smarttags" />Miami-Dade County (the chart is for single family homes only, and does not include condos). As of February 2010, there were 8,176 homes on the market. This is a 52% reduction from the high of 16,987 homes for sale in July 2008. 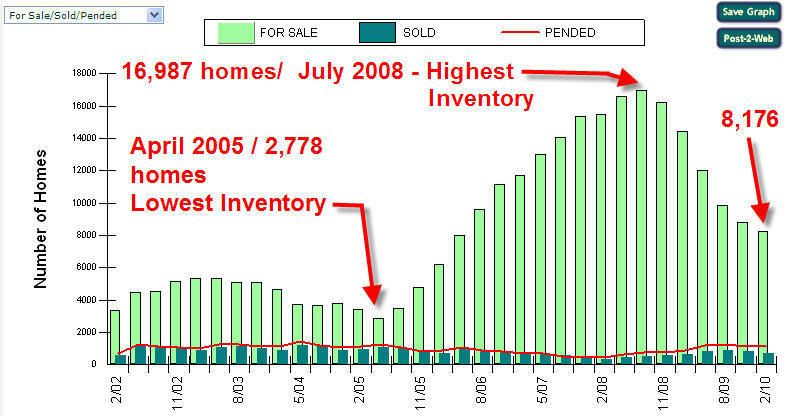 The low point of the inventory was April 2005, when there were only 2,778 homes for sale on the market. This weekend I inspected a small commercial property on <?xml:namespace prefix = st1 ns = "urn:schemas-microsoft-com:office:smarttags" />NE 2nd Avenue and could not help but see the beautiful Bacardi Museum Building a few blocks away, a Miami Landmark. In 1960 all the Bacardi buildings were confiscated by Cuba, and they moved to Miami and built this building as their headquarters. There are 28,000 specially designed mosaic tiles on the outside of the building. Enjoy these photos as it was a clear and bright day for photography. Notice how Architect Enrique Gutierrez (Coral Gables) cantilevered the north and south sides of the building 24' form the central core. See the "floating stairway" under the south cantilever below. This was an advanced technique used extensively by architect Frank Lloyd Wright. Photos by Britt J. Rosen using a Cannon S90. The extreme color photos are "foil" using Paint Shop Pro which brings out interesting shades. For instance, in the foil photo above, it appears a vine is crawling up the left side of the building. Here is a colorful photo of the Coral Gables Trolley taken from my car through the windsheild. Click here to see the an old photo of the trolley along Miracle Mile when they were first in service, in April 1925. This photo was taken from the pool deck of the new 500 Brickell Building, looking north at the City of Miami's Central Business District. The photo was "stitched" together using three photos that were overlapping. Miami was nicknamed "The Magic City" in the early 1900s because buildings seems to appear from nowhere. In fact a new office building is obscuring the view of One Biscayne Tower on Biscayne Boulevard. Miami was officially incorporated as a city on July 28, 1896 with a voting population of a little over 300. Since then it has grown into a thriving metropolis. According to the 2000 Census, its population is 362,470 and by 2010 it is projected that 390,191 people will call this city their home. The deadline for filing the real estate tax petitions is approaching for Miami-Dade and Broward. The Palm Beach deadline was last week. The "hot links" below will take you to sites where you can file an appeal. The filing fee is $15 per folio. If you have consecutive folio numbers, they are $5 per folio. Email Britt regarding any questions you have. Property owners that have Citizens policies were sent letters that they must get an appraisal for the replacement cost of the home in order to renew the policy. This replacement cost is not a “market value” as in a traditional FannieMae home appraisal for mortgage financing. It is a cost approach and for the cost new, exclusive of depreciation. The letters are saying that the policy has been "cancelled." However, as long as the property owner fulfills the new requirements, including the "replacement cost new" for the structure, the policy will be renewed. A new policy is that homes whose replacement value is more than $750,000 will require shutters. This shutter rule is part of a 2007 insurance legislation which is now being enforced. I have an extensive background in building construction and we can prepare these replacement cost reports. Please contact me at 305 663-7334 x107 and we can discuss the "insurance appraisals" with you on both commercial and residential properties.